I’ve kind of been on a “Bisquick kick” the last couple weeks because I checked a Bisquick cookbook out of the library to try out and see if it’s worth buying. With baseball season starting up, I need quick, simple and delicious recipes to have ready so we don’t end up eating hot dogs night after night at the ballfield—nothing against hot dogs, but boiled ones from the snack shack, yeah, not the greatest. So far this book is a winner and all the recipes I’ve tried have been really good and all my boys have loved everything. The thing I’ve loved most is that all the recipes are so quick and simple and I have all the ingredients in my pantry and don’t have to run to the store. 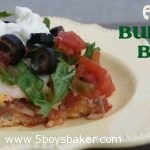 We loved this burrito bake. Definitely serve it with extra salsa and sour cream and I think next time I’ll throw some cilantro and avocado on top. I think it would be great to try adding some ground beef or shredded chicken. Heat oven to 375°F. Spray 13x9-inch pan with cooking spray. In medium bowl, stir Bisquick mix and cold water until soft dough forms. Press evenly in bottom of pan. Spread beans over crust. In small bowl, stir together rice and 1/2 cup salsa. Spread evenly over beans. Top with cheese. Bake 25 to 30 minutes or until cheese is melted and crust is golden brown. Top with lettuce, tomato and olives. Serve with additional salsa and sour cream. The dough can be kind of a pain to spread into the pan so to make it easier, keep your fingertips slightly wet while doing it.